One of the most important things to do before you start investing is defining your investment goal. An investment goal is a realistic expectation to meet the returns by investing a predefined money for a fixed time frame. The key words here are ‘realistic expectations’ and ‘timeframe’. You are interested in investing in stocks. Great! 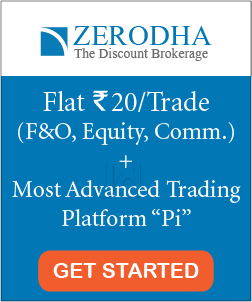 However, if you are planning to invest Rs 50,000 in the market and turn it into Rs 100,000 with 6 months, then please stop there. Historically speaking, stocks have given better returns than savings, bonds, FDs, golds etc, however expecting to double your investment amount in 6 months is more like gambling. While defining your investment goal, set a realistic expectation. An average annual return of 10-15% is amazing if you compare it with 3.5% interest return on savings. Further, if you are investing intelligently, you can easily beat the market and get better returns. 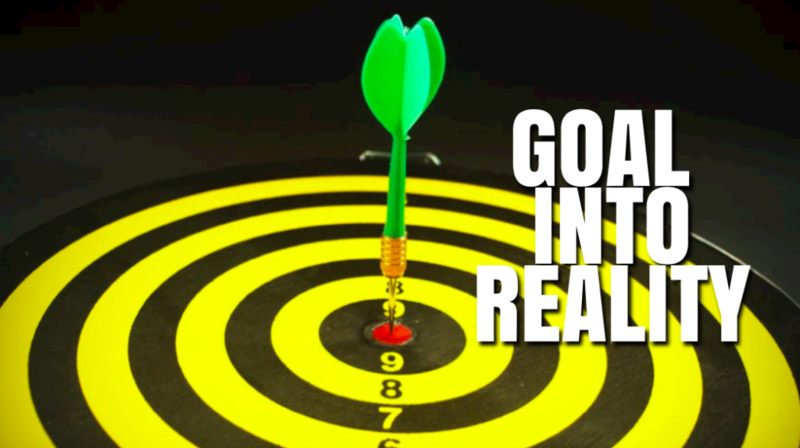 Nevertheless, setting unrealistic goals will force you to take ‘un-necessary’ risks in order to achieve that target. These risks can adversely affect your portfolio and even might not be achieved. That’s why it’s really important that you set a realistically ‘achievable’ goal for your investment. Honestly, not many people can make a living by investing alone. Why? Let me explain. In India, for an average family, the yearly income is 10 lakhs. As we discussed in the first point, the average annual return for the market is 10%. 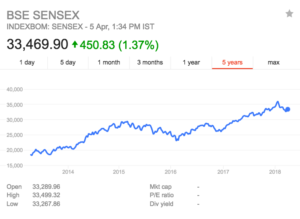 In order to get a return of 10 lakh in a year with a return rate of 10%, you will need to invest a huge amount of INR 1 crore. Even if you are getting an aggressive return of 20% per annum, still you will need an initial investment of Rs 50 lakhs for making a livelihood. Frankly speaking, not many people have this much amount of money to invest, especially, if you are in your 20s and recently started your career. That’s why people who are involved full-time in market choose ‘trading’ as a profession where they can get benefits of leveraging. In short, if you have this huge amount of money, then great. You can start your journey as a full-time investor. 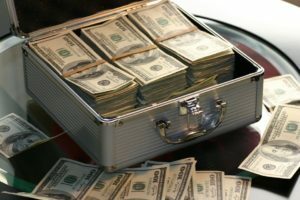 On the other hand, if you do not have so much money, then you need to find out other sources of income. NOTE: Even the legendary Investor Warren Buffett worked as a ‘fund manager’ at the beginning of his career. He wasn’t just a full-time investor in the major half of his journey. Warren Buffett gathered a big amount to buy ‘Berkshire Hathaway’s share by working as a fund manager (not an individual investor). Also read — How Warren Buffett Made His First $100,000? While investing, it’s equally important to avoid loss than to make profits. Moreover, personally, I believe that avoiding loss is even more important. Even Warren Buffett considers the same. Here’s a quote from him regarding the importance to avoid loss. 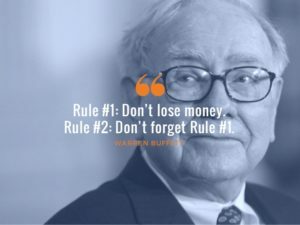 Why is avoiding loss is so much important in investing? Let me explain this with the help of an example. Suppose there are two investors- A and B. Investor A gets a consistent return of 15% per annum for 10 consecutive years. On the other hand, Investor B gets a return of 18% per annum for 10 consecutive years. However, in between these 10 years, once he got a negative return of 15% in his 8th year. Who do you think will get better returns after the end of 10 years? Investor A or B? Although Investor B consistently beat investor A for 9 years with 3% margin, however for the long run, Investor A outperforms investors B. 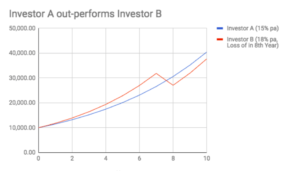 Investor A gets more returns than investor B at the end of 10th year. An important lesson to learn here is that a consistent compounding with ‘no loss’ adds more money. The loss interrupts the compounding process. Another important point to discuss here is that the loss is much harder to earn back. 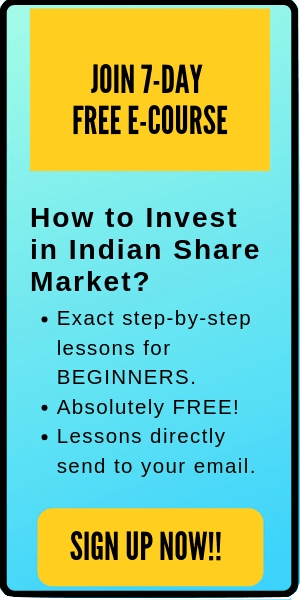 For example, Suppose you invested Rs 1,000 in a stock and lost Rs 500. Here, the incurred loss is 50%. However, in order get back your initial investment amount, you have to earn Rs 500 now by investing the remaining Rs 500. Overall, a return of 100% is required to cancel the loss of 50%. In short, although you lost just 50% on your investment amount, however, you have to earn a profit of 100% in order to break even. This is due because earning back is much harder than ensuring a loss. To conclude, try ‘not to lose’ large amount of money by following foolish investing approaches. It’s really difficult to earn back the same money. Set a realistic expectation for your investment. Otherwise, it will force you to take unnecessary risks. Understand that making a living just by investing is difficult. That’s all. I hope this post is useful to you. If you have any doubts or need any help, please comment below. New to stocks? Want to learn how to select good stocks for long-term investment? Check out my amazing online course: HOW TO PICK WINNING PICKS? The course is currently available at a discount. #HappyInvesting.